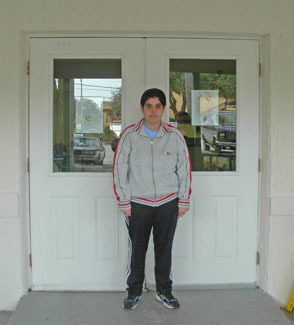 Izzy was a member of the first class of students to participate in the Learning Academy, a two-semester program at the University of South Florida that prepares young people with autism for employment. The Learning Academy began as a grant from Autism Speaks, and is now an approved vendor for vocational rehabilitation services. Izzy and her classmates spent the first semester completing assignments that emphasize the skills adults need for success, including building personal and work relationships. With support from their professors and student mentors, Izzy and her class also completed assignments to assess how their own skills and interests could be useful for employment. Izzy presented what she had learned about herself at a special event at the end of the semester. She talked about being friendly and compassionate, and about her skills in baking and doing chores at home. Over winter break, the professors matched each student with an internship. Based on her skills, interests, and strengths, Izzy was placed at an assisted-living facility. Each week, she spent part of the day at the internship and the rest of the day in class. Her duties at the internship included preparing and serving food, helping people eat their meals, and cleaning the dining room and kitchen. Izzy became friendly with the director, her coworkers, and the residents. Initially, Izzy wasn't comfortable starting conversations with people she didn't know. Her coworkers helped her gain confidence by giving her strategies. For example, they suggested that Izzy could strike up conversations with people by complimenting them on their clothes. Izzy tried this strategy with some residents and found that it worked well. Although writing is a challenge for Izzy, she practiced with support from her mother, keeping a journal about how each day had gone and anything she wanted to remember. For an hour at the end of each week, the class gathered for an "internship roundtable," where they each picked a challenge from their journals and asked the other students for advice. This roundtable provided more chances for Izzy to practice her relationship-building skills, as she and her classmates taught one another how to resolve workplace issues. Izzy and her classmates gathered the journals and other work from their classes and internships into portfolios that they could present to prospective employers. When Izzy graduated and the Learning Academy instructor, Susan Richmond, asked her what she'd like to do, she said she was still interested in a job serving food. Susan approached Aramark, a food services company, to introduce them to Izzy. When the interviewers met Izzy and saw her portfolio , they became interested in supporting her to find a job with them. Izzy now works for Champions' Choice, a student dining hall at the University of South Florida run by Aramark, that caters to student athletes. She has been a server and cleaner there for over a year, and loves her job. She works fifteen hours a week at $8.37 per hour. Izzy likes her work routines and wearing a uniform, and she gets along with her coworkers, but she also appreciates that other people understand her and let her be herself. She gets along well with her boss, and also has a coworker she can talk to if needed. She is always at work early, in spite of a difficult commute. The internship opportunity gave Izzy a chance to develop her communication skills and her comfort level around new people. The internship roundtable became an important opportunity for Izzy to give and receive peer support and develop relationship-building skills in preparation for employment. Izzy's portfolio of written work from her classes and record of her daily internship experience demonstrated to a potential employer the ways in which she had developed her interpersonal skills.